Invented by Swedish ENT specialist, Dr. Bjorn Pertruson in 1990, the Nozovent nasal dilator is an anti-snoring device. Simply designed and easy to use, the Nozovent does not require any special fitting, adhesives (like nasal strips), or a snoring mouth guard. Clinical trials have demonstrated the Nozovent widens nasal passages and increases airflow up to 50 percent, reducing or eliminating snoring. It has also been shown to reduce mouth breathing. Scandinavian Formulas, Inc. is a 25-year-old company headquartered near Philadelphia, PA. It was founded to supply high-quality products to the nutritional, food, pharmaceutical, cosmetic, and pet care industries. The company is divided into three divisions: Chemicals & Ingredients, Consumer Products, and Bulk Softgels, Tablets, and Capsules. The Chemicals & Ingredients Division offers amino acids, botanicals, extracts, herbal products, hydrocarbons, lubricants, marine oils, minerals, nutritional ingredients, and oils to various industries. The Consumer Products Division was created to manufacture and sell a line of nutraceutical products which are distributed via high-end pharmacies and health food companies. Products include Shark Liver Oil, STIRX (for eye health), LaBeaute (for skin health), Good Breath, SalivaSure (for relief of dry mouth), and Nozovent (to help snoring). The Bulk Softgels, Tablets, and Capsules division was created to offer these products to contract packagers and suppliers in the nutritional supplement industry. The Nozovent nasal dilator resembles a dumbbell. 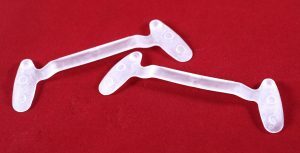 It is made of a flexible plastic strip the user curves into a “U” shape and fit into each of your nostrils. The wings on either end of the strip press on the inner wall of each nostril, exerting pressure to increase the size of the nasal passages. The specially designed “nodules” at either end of the plastic strip ensure the device does not come into contact with the mucous membrane or cause a nosebleed. The device works on the same principle as isometrics. It only takes a few seconds to properly insert the Nozovent into your nose. Once you have inserted the device, you only need to get used to wearing it. One issue that some users experience is discomfort if you are a side or stomach sleeper. They also had some issues with keeping the device in place. After use, the Nozovent is easy to clean with soap and water. It can also be sterilized in boiling water. Available in two sizes, it is important to choose the correct size. While most users find the medium size to fit comfortably, users with particularly well-developed noses may prefer the larger option. The device is not adjustable, but the wings of the device can be trimmed with an ordinary pair of scissors for a more comfortable fit along the sides of the nostrils. It is recommended the device be replaced every three months or so. 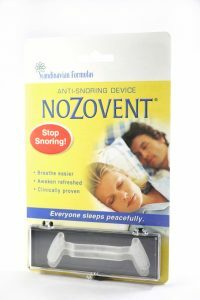 How does Nozovent prevent snoring? Worn in the nostrils, Nozovent physically widens the airways by placing gentle pressure on the nostrils. By increasing nostril size both vertically and horizontally, airflow is increased and snoring is reduced or eliminated. As an added benefit, use of the Nozovent has been shown to eliminate mouth breathing, reducing dry mouth and dryness of the bronchial mucous. In some users, this has helped reduce coughing and asthma symptoms. It is somewhat an opposite strategy to the Theravent. Both devices show success with some users so the need for trying and testing your results is required. Most users found that Nozovent is a reliable and cheap way to alleviate snoring. It can take some time to figure out how to properly insert the device (there is a YouTube video that demonstrates the correct way to insert and wear the device) and to get used to it, but once the learning curve is over, it can last for several months of effective use. Users agree the Nozovent is a better alternative to nasal strips (which involve using an adhesive to apply the strip to the outside of the nose – and that doesn’t always hold all night). It is also a great alternative for people who do not want to wear a mouthpiece. With the price point so low (about $15 for two at Amazon) and the ease of use, it’s worth giving it a try. I was initially impressed with Nozovent due to the unique design of the product. It is elegant in its simplicity. It has a “natural” spin to it, being manufactured by a company called Scandinavian Formulas (with a very earthy logo), which gives it the gloss of a well-respected, environmentally friendly company. Unlike other nasal dilators, this is not a cone or a vent. Available in two sizes, it is only minimally adjustable. You cannot adjust the length of the device, or the amount of pressure exerted on your nose. You can only adjust the end “wings” to better fit the side of your inner nasal passage. Both ends of the product are inserted into the nose with the middle length forming a loop outside the nose, kind of like the nose ring that bulls wear. The design enables the nasal dilator to extend both the horizontal and vertical openings of each nostril. Since the two sides are held together, there is a force that pushes against the side of the nostril and the wedge on each end pushes the nasal opening wider in the vertical direction. I was very happy with the way this device felt. It was easy to insert and there was no initial discomfort. I started the Snorelab app on my smartphone and fell asleep. Upon waking up, the Nozovent was still in place. It had stayed put all night. However, I felt intense pain in my nostrils. This was from the continuous, unrelenting outward pressure all night. Since the Nozovent pushes into four specific locations (where the “nodules” are located), these areas of contact got very tender. I was eager to remove the device, due to the intense pain. My snore score was 30, which was slightly lower than normal, but not much. When I listened to the recordings from Snorelab, it sounded like business as usual. Because of the high level of discomfort the Nozovent caused, more than other nasal dilators, I will not use it a second night, and it gets a very low score on our ranking scale. 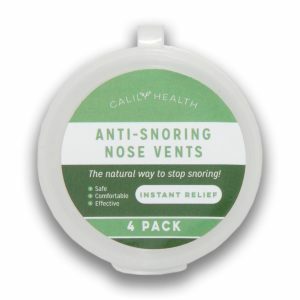 Although my personal experience was unpleasant, many other users have found it to be effective at reducing snoring. At $15 for a package of two, it’s not an enormous gamble to try it out. As we all know, different snoring aids work differently for everyone who snores. This wasn’t the one for me, but it could be the one for you. 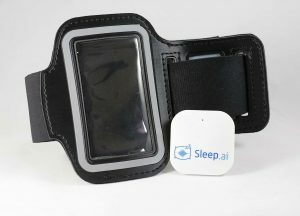 We’ve reviewed the best snoring devices and the products that have worked best for us as well as what we have heard from the majority of our site visitors are snoring mouth pieces and mouth guards. Can Salt Therapy Help with Snoring?